Damo and Vikki's Round the World Trip! 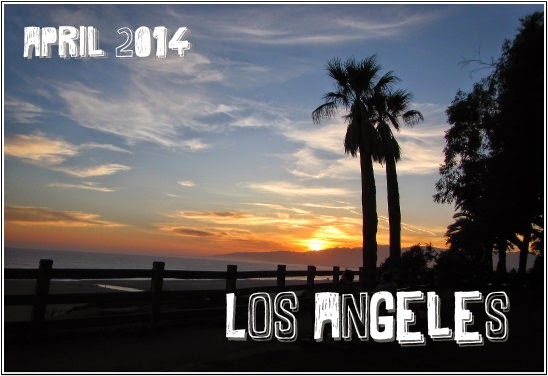 : LA Highlights! We arrived in LA after a 1 hour flight which left late as there was a problem with a door, then Damo’s case came off the carousel with the zip split open!! We then got a shared shuttle to the hotel which took ages! But finally we arrived at the Lowes Hollywood Hotel which was amazing!! It’s attached to the Hollywood & Highland Center, which has shops, restaurants, the Chinese theatre (where they have the stars handprints) and the Dolby Theatre, which is where the Academy Awards take place. After checking in we went to the Hard Rock Cafe as it was literally downstairs and there was a guy doing an acoustic set on his guitar! We had a bit of a look around but then went back to our room to plan what we were going to do while we were there. The following day we caught the bus to Warner Bros Studios to do the tour! Arrived at the studios, which were huge! We bought our tickets and were put straight onto the next tour so we didn’t have to wait. First we watched an introduction movie then went with a tour guide to a cart which drove us around loads of outdoor sets, fake buildings and streets, where lots of films and TV shows had been filmed. Then we stopped at a building which was a museum of movie props and costumes, the first floor had costumes from Man of Steel, Dark Knight, Hangover, Friends and loads more, and the whole of the top floor was Harry Potter! We then got back on a cart and were taken to some indoor sets, we went inside the set of 2 Broke Girls, then into a building which was full of cars from movies! 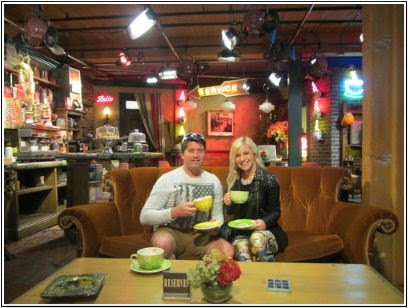 They then took us into a room which had been filled with all of the props and set from Central Perk and we got to sit on the Friends sofa!! We then got to go inside the Ellen studio as it was a Friday which meant she wasn’t filming that day! The tour was awesome and lasted ages, I was surprised how much we got to see! The next day we took a photo of the Hollywood sign from the hotel, before heading to Universal Studios, which was just 1 stop away on the metro. We had been to the Florida one but there were a lot of different shows and rides here, there is also a whole area of film sets and studios like we’d seen the day before at Warner Bros. We got to see a few of them on the Backlot tour, I have so many photos and at the time we were told what film or TV show they were from but looking back i can’t remember what any of them were, other than Whoville from the Grinch!! We also had our photos taken with the Transformers and they were amazing they actually speak to everyone and sound just like the characters! Our favourite show was Waterworld, which is based on the film. And The Blues Brothers show was the biggest load of poo I’d ever seen, the one in Florida is so good so I was expecting the same but we walked off halfway through, it was that bad! All in all a good day, we arrived in the morning and stayed til 8.30pm so we were able to go on all the rides and see all the shows! The following day we went to the Chinese Theatre, well actually just the outside of it, to look at all the stars hand and foot prints, it was so busy! There are some really old ones like Marilyn Monroe’s which is from 1953, and some much newer like the cast of Twilight. I was so confused about why Michael Jackson’s hands were so tiny but I later found out they made his one in 2012, and it’s his kid’s handprints along with a handprint of his glove! We then made our way down to the Pantages Theatre to watch Book of Mormon! We also realised there was a load of walk of fame stars that we had missed up by the Capitol Records building so we walked up and down there but it was mainly people we’d never heard of. Book of Mormon was hilarious and amazing, GO AND SEE IT!!! The next day we checked out of the hotel and got a taxi to Santa Monica where we were staying for 2 nights. Santa Monica was so different to Hollywood and so much nicer, we wish we had stayed there longer! We stayed at Cal Mar Suites, it was like a mini apartment with a separate kitchen area and walking distance to the beach. The room was ready straight away so we checked in and headed down to the beach, we sat on the beach for a couple of hours then came back to the hotel and went in the pool. We then went to have showers and get changed and realised we both hadn't put sun cream on and looked like lobsters, argh!! We went back out and headed down to the Third St promenade, which was so nice, full of restaurants and street performers who were actually good! On the way there we watched the sunset over the beach. We found a supermarket and got a few things to take back seeing as we had a fridge, freezer and oven in the room. Next day and we headed down to Santa Monica pier to hire bikes for the day. We first rode to a post office as we had a load of stuff we wanted to send home, but it was going to cost $70 so we didn’t bother! We rode down to Venice Beach and on the way saw Muscle Beach, we got as far as Marina Del Ray then turned back towards Santa Monica. We were going to head in the other direction but by now our bums hurt from the bike seats! So we returned the bikes to the rental place and walked onto the pier. We went on the ferris wheel and the view of the beach was awesome! After that we headed back to the hotel, I had a massive headache from the sun so i had a lay down, then we went out for dinner to Bucca Di Beppo which is an Italian and it’s all huge portions made to share! It was so good! The next day was our final day in LA and we had our flight to Fiji at 11.30pm. We had to check out of the hotel at 11am but we stored our cases there, went to McDonalds for food and wifi, bought a Lonely Planet Fiji book and went to watch the new Captain America at the cinema! That evening we caught the bus to LAX ready for our flight! First Blog Post! Well Hellooo!